Despite being a relatively young niche fat bikes are still gaining popularity in the UK. Primarily, fat bikes are all about delivering superior traction and flotation over unpacked surfaces, but there is a lot of variation in how riders are using them. Originally intended for riding on snow or sand, fat bikes have now found their way onto normal everyday trails for the fun and unique ride feel they deliver. Monster truck-style tyres mean exceptional amounts of traction and contact patches big enough to prevent these machines from sinking into snow and sand. Big tyres and low pressures mean suspension is essentially built in and, although you can get bikes with fat suspension at one or both ends, it’s certainly not a necessity. 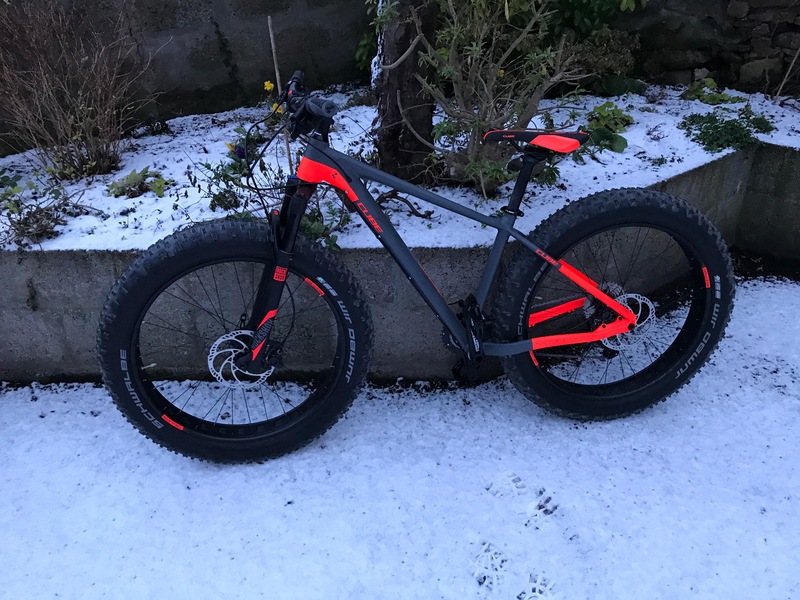 Building a fatbike isn’t just a question of cramming extra wide tyres into the frame – there are other considerations, too. That’s why with the Cube Nutrail, we took our usual approach of sweating every single detail. The result is a unique fatbike chassis with special geometry and the kind of attention to detail you’d expect from CUBE. For example, the frame is surprisingly light thanks to our triple butted and hydroformed High Performance Aluminium (HPA) tubeset. We equipped it with a tapered head tube for better steering precision on the roughest of trails, while an extra wide PressFit bottom bracket shell and 197mm 12mm through axle both contribute to an exceptionally stiff and efficient design. Touches like cable routing for a Sideswing Direct Mount front derailleur, replaceble gear hanger and internal cable routing ready for a dropper post upgrade just add to the appeal. Fat is the new versatile……..